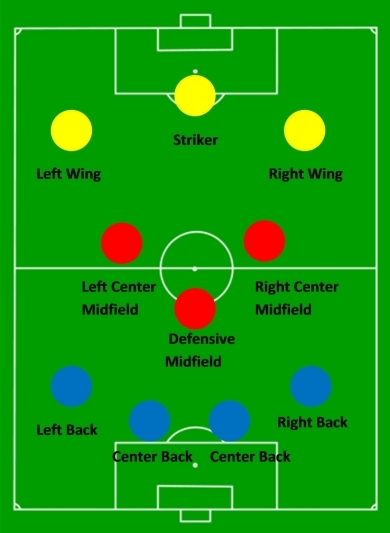 Soccer has a number of formations, but, unlike basketball, teams only play one or two each game. 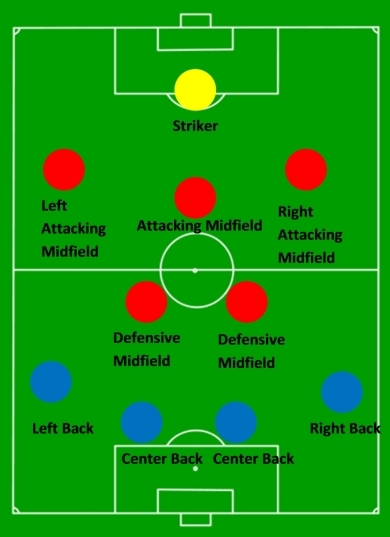 Currently, the most common formations are 4-4-2 and 4-3-3. The numbers represent, from left to right, the amount of defenders, midfielders, and forwards. Notice that the numbers only add up to ten. The goalkeeper need not be included because it’s understood that there will always be a keeper. All formations can be played with an emphasis on offense or defense. Below are diagrams and descriptions of some of the most used formations. The 4-4-2, traditionally considered a very balanced formation, is so ubiquitous that there’s even a magazine named after it. All eight defenders and midfielders participate in defense, and the forwards pressure opponents back to the midfield line. On offense, all the midfielders are given the freedom to press forward in attack, though one of the center midfielders will often stay back in case of a counter-attack. The team is free to play down the touchline, with the fullbacks supporting on the wings, or they can push the ball through the middle of the field with the center midfielders controlling the pace of the game. 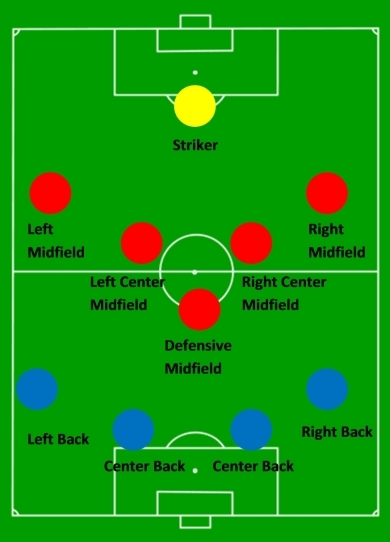 In addition, one striker often drifts into the middle of the pitch to support the midfielders, though this is sometimes referred to as a 4-4-1-1. For more information on the 4-4-2, see USA tactics. Considered one of the more attack-minded formations, a 4-3-3 requires midfielders with excellent passing and dribbling skills to generate offense and control possession. Against a 4-4-2, the 4-3-3 has a numerical advantage in the middle of the pitch, with one of the midfielders almost always staying close to his own center backs. The wingers will attack down the side and cut in to the middle, with the fullbacks coming from behind to provide extra attacking width. 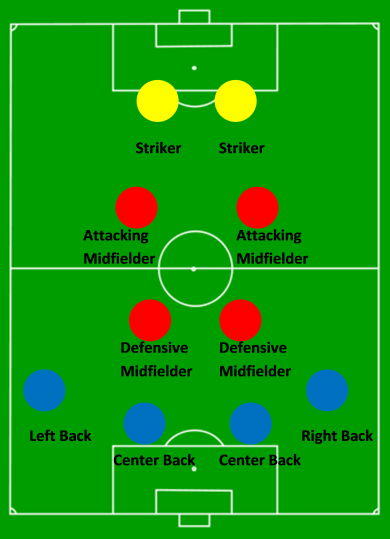 The striker and wingers have the freedom to exchange positions and often do in order to mask where the next attack will come from. 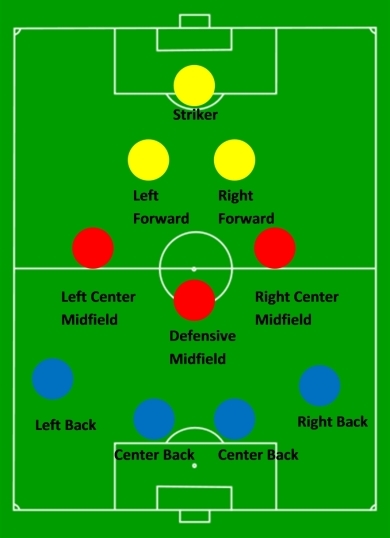 This is a variation of the 4-4-2, with one of the strikers moving closer to the midfield and playing as a center forward (sometimes referred to as a withdrawn striker), who then becomes the focal point of the offense. The 4-4-1-1 can suffer from predictability if the team relies too much on the center forward. 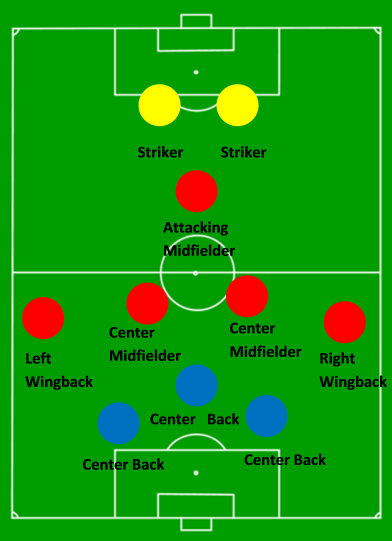 The United States has played this formation in the past with Landon Donovan as the withdrawn striker. The 4-3-2-1, much like the 4-3-3, relies on skillful midfielders to generate offense. However, the lack of wingers makes this formation a bit easier to defend unless the fullbacks are able to venture forward and produce crosses. If a team has an abundance of attacking players and two strong Center Defensive Midfielders (CDM), they can play a 4-2-3-1. One of the CDMs tends to play a bit higher than the other and has the job of shuttling the ball between defense and attack. As always, the fullbacks must have a high work rate in both attack and defense. 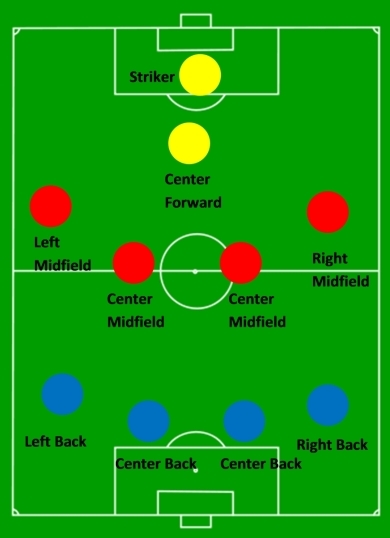 This formation is frequently used by teams seeking to protect a lead (the US will occasionally switch to a 4-5-1 in this situation) or underdogs attempting to clog passing lanes against a superior opponent. The high number of midfielders helps a team defend, but unless one or two of the midfielders surges forward in offense, the attack can stagnate. In what can be an irritant for soccer fans, TV announcers sometimes refer to a 4-2-3-1 or a 4-4-1-1 as a 4-5-1, though in modern soccer, to be fair, the 4-5-1 is not so much a distinct formation as it is an overarching idea of deploying 5 midfielders + 1 forward. 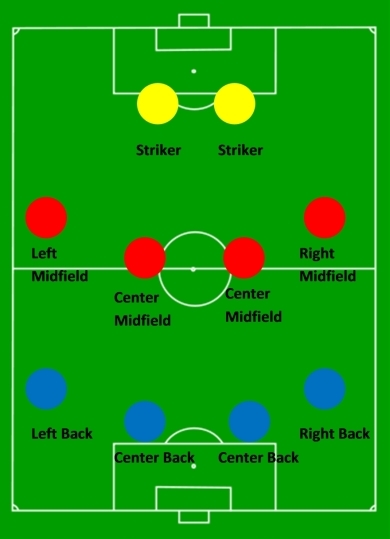 Though not commonly used in recent years, the 3-5-2 remains an excellent formation for dealing with two strikers. Two of the center backs essentially play man-to-man on the strikers, while the third – traditionally called a sweeper – is free to roam. The best sweepers are also able to push forward and help the attack. The 3-5-2, however, faces problems against single-striker systems: two of the center backs have to push out wide to guard wingers or the wingbacks have to drop back for the same reason, leaving extra space for attackers and/or neutralizing the wingbacks’ offensive production. An offshoot of the ubiquitous 4-4-2, the 4-2-2-2 requires more offensive production from its fullbacks. Since the outside midfielders play as central attacking mids (or, in some systems, secondary strikers), the fullbacks must come forward or the attack will get bottled up in the middle of the pitch. The United States sometimes ends up playing a 4-2-2-2 when Landon Donovan and Clint Dempsey venture inward. You don’t have the ‘diamond’ 4-4-2, which a fairly high number of teams play. It gets lumped in with the one you’re showing, but the role of the two midfielders is very different. In your ‘orthodox’ 4-4-2 above, usually the two central mids are box-to-box types, both expected to do a lot of attacking and defending, and they typically operate on the ‘pulley system’ (when I go forward, you go back and cover). In the ‘diamond’, we generally know which CM is generally the attacker and which is the defender, and they don’t switch much. It seems these days the diamond is even a little more common than the orthodox 4-4-2. The New York Red Bulls currently seem to be using the diamond, with Dwayne DeRosario as the ACM, and Teemu Tainio as the DCM. Real Salt Lake does as well, with Morales as ACM and Beckerman as DCM. would you be willing to do a write-up on the 3-4-3?? So much for the 4-4-2. It’s antiquated and does not work. So don’t defend it. I hate it myself. The 2 mids in the middle, don’t recuperate balls. It’s stupid. Go back to 1970. Only countries that’s can’t play football like Venezuela or USA. That’s funny the 4-4-2 is how the US beat Spain in 2009, that’s how badly it doesn’t work. The 4-4-2 is a bit outdated but England did use it at the 2012 Euros and made the quarter finals. With that being said they used the same formation in 1966.